"For me, becoming isn't about arriving somewhere or achieving a certain aim. I see it instead as a forward motion, a means of evolving, a way to reach continuously toward a better self. The journey doesn't end." Whenever a new president is elected, it is inevitable that the people vacating the White House eventually publish a memoir. I've read Bill Clinton's My Life, George W. Bush's Decision Points, and will no doubt read whatever book Barack Obama eventually publishes. While Hillary Clinton is the only First Lady whose writings I've read, Michelle Obama's book was one of last year's must-reads. I never got around to reading it during 2018, so it was a natural choice to start off my reading in the new year. Even if she never became First Lady, Michelle Obama's life story would be remarkable. Her family rented out the upper level of a home in the south side of Chicago, laying the foundation for her future and her appreciation of the privilege she would earn later in life. Her parents never had the money to lavish their kids with gifts or vacations, but they did make a marked effort to invest in their children's education. Obama defied the disadvantages of her gender, race, and class to earn a law degree from an Ivy League university and carved out the future that her parents always dreamed she could achieve. Naturally, a large portion of the book focuses on the Obama family's time in the public eye. Michelle writes about the oft-repeated story of her not wanting her husband to run for office. As he prepared to step into the political limelight, Barack was already stretched thin between his duties as community organizer, author, college professor, father, and husband. Obama writes of the effects of her husband's political and professional obligations in a way that any working wife and mother are sure to relate to. What struck me most about the aptly titled Becoming, was the ways in which Michelle Obama's story of finding herself and constantly evolving align with the aspirations of the country that her husband was elected to lead. Her trajectory in life was achieved through hard work, humility, and seeking to always learn and grow. At a time when our country is more divided than ever, I think it is vital that we look to stories like Michelle's to find our common humanity. At the end of the day, we are all still 'becoming', and the only certain thing is that each day will offer something new to love, challenge, and hopefully learn from. For more information visit Amazon and Goodreads. 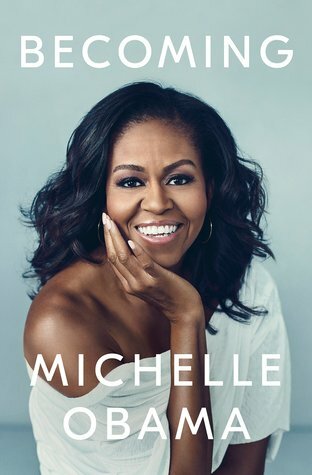 This entry was posted on Friday, January 11, 2019 and is filed under Becoming,Book Review,Family,Memoir,Michelle Obama,Nonfiction,Politics. You can follow any responses to this entry through the RSS 2.0. You can leave a response. I have this on audio, and look forward to listening. Wonderful review Ethan! I'm not usually one for memoirs, but I might have to pick this one up. Great review! Memoirs can be pretty dry, but I assure you this one is both well-written and engaging. Everyone seems to be reading and absolutely loving this book at the moment, and eventually I am also going to jump on the bandwagon. I'm curious. I think I'll try and get the audiobook of this one as it will be her reading it! Michelle is a great speaker, so I'm sure the audio version would be fantastic! Thanks! I really loved it!